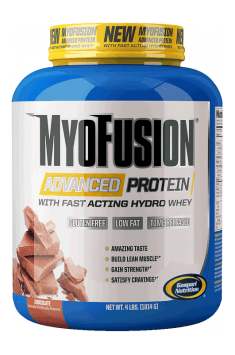 MyoFusion Advanced Protein exemplifies Gaspari Nutrition’s never-ending commitment to progress. CEO Rich Gaspari’s determination to develop the cleanest and most delicious lean protein powder led to this unrivaled advancement in sports nutrition. The ADVANCED formula is the ultimate time-released blend featuring fast acting whey hydrolysate, ultra pure whey isolate, high-grade whey concentrate, slow digesting micellar casein and complete milk protein. Every scoop is packed with 25g of clean muscle building protein with no added sugar, no synthetic colors, no corn syrup solids, no amino infusions and it’s gluten-free. 1-3 portions per day, depending on demand. In particular morning, after a workout and before bedtime. Members protein supplements achieve the best results by using the training and as an additive to food with the least amount of protein. Gaspari Nutrition is an American company that produces high-quality supplements for bodybuilders. Among the supplements there can be found, for example, modern protein products, and sets of amino acids that increase strength and support the regeneration. Their offer also includes creatine, gainers and pre and post-workout dietary supplements. MyoFusion Protein Blend (whey protein concentrate (from milk), milk protein concentrate (from milk), whey protein isolate (from milk), micellar casein (from milk), hydrolysed whey protein isolate (from milk)), maltodextrin, powdered sunflower oil (sunflower oil, modified starch, silicon dioxide - anti-caking agent), aroma, filler (carboxymethyl cellulose), emulsifier (soybean lecithin), salt, sweetener (sucralose), medium-chain triglycerides [medium-chain triglycerides. milk protein, dipotassium phosphate, tricalcium phosphate]. Contains the precursor of a potent steroid – nandrolone. Facilitiates budiling of muscle mass.